Lustre Products is a specialty manufacturer of Handrail Systems, Safety Barricades, Tools and Components for the elevator, lift, vertical transportation industry. They design and create a wide variety of custom, architectural, proprietary and standard products. FRP Installations is the Lower Mainland’s leading Fiberglass Reinforced Plastic Panels contractor. They offer sales, installation, & service of FRP Panel systems anywhere within BC and Alberta. FRP Installations provides panel installations for walls, ceilings, and more in variety of colours, textures and finishes. Pickering Safety asked us to develop an additional tool to the website that helps users to easily refill their First Aid Kits (required by WorkSafeBC ) with the recommended minimum contents for each level of kit. Salvation BioScience protects public health by providing reliable and certified cannabis testing services in a manner that reflects total commitment to Health Canada’s exacting standards, and we created a website that reflects this to their customers. For one of our existing clients, Urist Cosmetics, we set out to redesign and redevelop the website to a clean and modern standard. The redeveloped site is fully mobile-responsive, along with being easy to maintain for our clients. Adding new products, product categories, and highlight new and best-seller products is quick and easy. Sprayers Plus is a manufacturer of premium quality sprayers for both residential and commercial applications. We developed a website where users are able to purchase products online or find dealers around them. We built in a feature where the customers can search parts by sprayers model, make it easy to find the compatible part for their sprayer. Tattoo Medic is the only full service mobile tattoo clinic in Canada. The website theme and branding are based around the unique logo and is consistent on all pages. Tattoo Medic features a custom developed booking and checkout system, a photo gallery, custom map, and several contact forms. Westside drainage is a Plumbing & Drainage Company that serves Metro Vancouver and surrounding areas. Their website must provide clients with info they need and quick contact with the company. BioFine International provides Custom Synthesis and contract research services supporting drug discovery efforts. We worked to develop a complex chemical search system which works to search for any chemical compound regardless of the parameters. A unique feature is the ability to search for chemical compounds by drawing them. Pebo Stones is a stone fabricator located in Canada with over 25 years of experience. We redesigned and redeveloped their website to help showcase their products and services. The website contains a products section, custom designed to allow easy updates of new product swatches, and a gallery which displays their work. A Vancouver-based roofing company’s website is traditional with a modern approach. Komo Roofing’s website places emphasis on usability and functionality. Links and main areas of the website are easy to locate, with a modern website design that is clean and simple that helps bring visitors to pages they are looking for. Mining and Comminution Consulting company wanting to greatly improve their web presence. The project has solid SEO integration and a clean theme. As one of the largest distributors of asian food imports in the lower mainland, it was detrimental to have cohesive sort methods in place for their vast catalogue. The Blaeberry Estate Planning team approached us for a website redesign which entailed rebuilding their old Flash website into a modern HTML5 and CSS3 website. The new website features CSS3 animated graphics and brands every element on the website to seamlessly fit into the cutting-edge design. Our design process for Greenacres Golf Course was very thorough in capturing all details about their facilities. We designed a number of pages for the restaurant menus, pricing guides, event information as well as an interactive course map showcasing all 18-holes. We were contact by Green Acres Lake Park Resort to do a complete redesign of their website. The new website features a clean and user-friendly layout with easy access to the website features. We built a custom gallery and integrated Google maps for easy directions to the grounds. 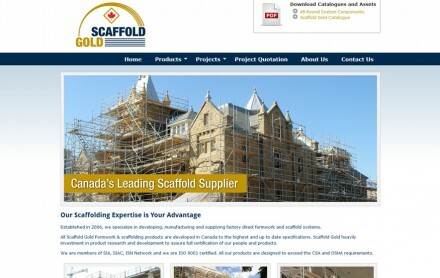 Established in 2006, Scaffold Gold is a leading scaffolding supplier to North America. They have been with us through multiple website redesigns since 2006. Services we provide range between web design, brochure design, and search engine optimization. For over 13 years Office Suites has been providing office space and virtual office spaces to businesses of all sizes. We were initially contracted to help with their online marketing campaign, but since then we are now their provider of web design, lead generation, email and online marketing services. Serving Calgary since 1963, Altadore Gymnastics Club is home to 2004 Olympic Gold Medalist Kyle Shewfelt. Their website serves as a hub of information, events, competitions, events, and training schedules to help members and parents find exactly what they are looking for. Start-up eCommerce company BestContacts is an online contact lens retailer. Our custom eCommerce solution enabled us to create a website to adapt to the complex specifications of prescriptions in the contact lens industry. An administrative area allows the client to insert, modify, delete and promote products with a click of a button! With a mission to fund research and help advance the cause to cure the various MPS disorders, the Caterina Marcus Foundation website keeps supporters updated with news, videos, and more. Additionally, donations can be made directly on their website using PayPal which makes supporting the cause that much easier. CRH Anesthesia is helping address anesthesia service needs at GI surgical centers nationwide. The main reason for the redevelopment was responsiveness and a cleaner user experience across the site. The website is redesigned to best practices – the load time is under 1 sec, faster than 90% of the tested sites according to online metrics. The website is also secure, making sure to utilize SSL encryption and HTTP/2 technologies. Moti Raja is focused on serving excellent food and giving exceptional service within Vancouver and the Lower Mainland. Their fully equipped kitchen serves a variety of dishes that has been thoughtfully prepared with only the finest and freshest ingredients. A quick website redesign serves the purpose to focus on showing their delicious food at the best quality possible on phone, tablet, laptop or desktop screens. M.A. Stewart & Sons Ltd. is a leading manufacturer and distributors of pipes, valves, and fittings in both Canada and the USA. With hundreds of products including a wide variety of options, it was crucial to make it easy for visitors to find what they were looking for. Custom developed product filters enable users to quickly sort through products efficiently. Once users locate the products they’re looking for, they may easily add it to an online quotation system. LeanLife health Inc. has developed a patented process to isolate omega-3 fatty acids from flax (linen) seeds. LeanLife omega products are in the form of an oil or a powder with a purity in excess of 98%. The products are sold as a food additive to food processors making such items as bread, noodles and milk products. Food4Change is an organic food supplier with in-house branding, international sourcing, processing, packaging, and distribution services. On their new responsive website, users can easily browse their specialty products by name, by type, by capability or by certification. The single product page features everything that the potential customers need to know about the product. Site visitors can also discover their wide range of competencies and easily contact the company with any questions through a web form. Polyculture is committed to support culture exchange between China and North America. The website is designed to inform about their events and read about Poly Culture related news in English or in Chinese. Site visitors can navigate very easily on this clean designed theme. The website built on WordPress, our clients can maintain and update the content easily. Elixir Consulting provides high quality financial advice specialising in clients who are going through divorce and separation in Canada. The website theme and branding are based around the unique logo and is consistent on all pages. The website features an easy to use and clean user experience, reflecting their commitment to simplifying and guiding their clients through the maze of financial planning of divorce and separation. Jade First Aid provides the highest quality first aid training and safety courses of all levels in Smithers B.C. We customized their new website using WordPress to showcase their courses, products, and services. Users are able to see upcoming course offerings and easily register online. The website features large high quality images that highlight the related first aid and safety pages. The website is fully responsive so it displays well on mobile devices and tablets. The CRH Payment site theme is a theme developed to be used by many microsites. Each microsite will have the same style but with slightly different content. Our WordPress theme developed specifically for this purpose make it easy for the client to create new sites without having to worry about manually changing things specific to each new site – e.g. site title on pages, links, etc. Vancouver Stairlifts is part of HME Accessibility and provides stairlift installation services to lower mainland, BC. The redesign of their website matches the look and feel of the parent company’s website to help tie the branding together. The new website has added features that help improve usability of the website, like the stairlift finder, or suggested recent project installations. VisBids is an online auction service with customers from individuals, to lawyers, to realtors and executors. The website was designed to have auctions displayed through-out so users can easily spot new auctions and browse through current ongoing ones. The site did not need a lot of imagery since the auctions take center-stage and each auction has enough images to make the site look visually-appealing. The custom template makes it very easy to do edits as using any HTML within the WYSIWYG editor is not necessary. HighQ Windows & Doors manufactures quality windows and doors. We did a redesign of the website so that the visuals take center-stage, allowing the website to showcase all the great project and product photos. The products and projects are reorganized so that they are easy-to-find from a user-experience stand point. We have taken the theme of “windows and doors” and incorporated that into the design, including the interactivity of the website. Founded in 1986, RAM Construction has become a leader in the construction industry. With an extensive portfolio of successfully completed projects, we redesigned and redeveloped their website to help showcase their past work. With the new custom-built WordPress theme, the client can now easily add new or edit existing projects to their online portfolio, while having a navigation and project-sorting system that is intuitive to users and allows flexible sorting methods. We have completed a new responsive website re-design for a long-term client which will accommodate the various new ventures we anticipate to promote for them as well as bring the their existing brand into this decade. Our responsive design was built with Bootstrap framework and features a robust product database; each product is complete with custom fields of data associated with rentals, specials & packaged products. A website designed and developed for a Vancouver-based structural engineering firm, Allester Engineering. The website is a custom-made, responsive WordPress theme, with easy-to-update capabilities to cater to the needs of this client. The theme features a tidy sorting mechanism on the projects page, which allows users to filter out projects and view only what they want to see. Many of the components on the website, such as the team members page, project details, and even the hero images in the homepage slider are fully customizable. This project features a robust configuration of custom fields and custom post types to organize the various furniture pieces with their respective customization options. Lightboxes for each gallery and tooltips for each customization option are present throughout the site. It features a glossary, client testimonials and a vast amount of furniture-related resources in addition to their full product line. Mainland Sleep specializes in sleep apnea treatment and equipment. The website is tailored to all – sleep apnea patients, physicians and interested parties. The products are sorted by both Category and Brand and are supported with a search feature. Designed to take each type of user every step of the way towards their search intent, Mainland Sleep remains a useful and robust web tool for sleep apnea and related products. One of the keys to this project was ease of access to the client. With many products to come and a lot also on Amazon, he needed to be able to log in and make quick changes and additions. We built a custom product type that will let him organize all of the data fields and have the product display them in a functional table layout – eliminating the need for him to have to format the content himself. Acclaimed by NATIONAL GEOGRAPHIC MAGAZINE SOCIETY as “One of the most accomplished contemporary Jade Sculptor’s in the world “. LYLE SOPEL is a nature inspired Artist who creates original bespoke Jade Gemstone Sculptures. On a tight deadline to meet a trade show, the website is designed and constructed to handle and display media beautifully across devices for flexibility in showing their pieces to clients – we accomplished this within 4 days. Enterra Feed Corporation converts food waste into sustainable animal feed ingredients and concentrated natural fertilizer. The website is very focused on green technology thus a green theme was suitable. Built in is also a full responsive design which supports a condensed drop-down menu and dynamic resizing content panels which stack according to how much space is needed for everything to be legible. South Hall is a spacious wedding and banquet hall offering as much catering as it does full event hosting and services. With all of that content the website needed to have easily-accessible portals on the homepage and drop-down menus to tuck away some of the sub-pages. Everything from menus to galleries is well-organized and able to be managed with relative ease. English Bay Inn is a Bed & Breakfast located near the heart of Downtown Vancouver. The website shows a comfortable getaway despite being in the city through the use of clean graphics on the website working to achieve a homey feel. The promotions are very clear and the various hotel-specific third-party plugins throughout the site are integrated seamlessly. Vancouver Stairlifts is a long-term client which we have been working closely with to establish a slick redesign of their website. The old product structure was changed and everything is all optimized for accessibility. There’s a lot more room on the website for quick additions and promotions when needed as well as the consistent elements on the website made to be less obtrusive. Safari Diamond is highly specialized in what they do as a leading Canadian manufacturer of diamond drill bits. The website serves to showcase their unique product line and their product specifications in a clear and informative way. There were a lot of opportunities to implement CSS animations and interactive java components for the interior pages as much of what needed to be portrayed had to be shown rather than simply listed. 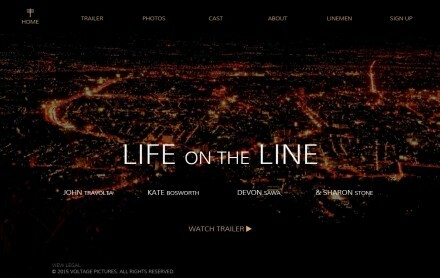 As streamlined as the design is, the development of this website is far from simple. A custom content management system built upon WordPress provides the client the flexibility to promote businesses within their community at any time. With custom Google Maps integration, and a dynamic self-managed calendar; maintenance of this website has never been this simple and affordable. CotonField Dog Centre is a new dog facility which is surrounded by beautiful gardens, flowers, tall mature trees and large open grass areas. We were selected to develop the website using WordPress and features a system whereby the client can add events, calendar items, news and more. The website serves as an online brochure for prospects and allows people to view availability instantly through the interactive calendar. Based in Chilliwack BC, Kuro is a modern and trendy Asian Fusion Restaurant. Their website serves as a traditional informative website, but also conveys a modern design which reflects their business. In addition to website design we also help Kuro with their ongoing marketing strategies through paid search and social media outlets including Facebook, Twitter and YouTube. These efforts gain more exposure and keep their clients informed of their latest news and promotions. With a wide array of technology services Data Shapers focuses on Software as a Services (SaaS) solutions to businesses all over the world. We were contracted to help redevelop their online presence with an emphasis on a design that conveyed a clean layout and user-friendly navigation all while being integrated into WordPress as their content management system. Primo Sports strives to achieve excellence in teaching Soccer to youth and young adults without deterring from the fun of the game. The website design needed to be attractive to both young and mature audiences while maintaining a clean design and an aura for professionalism. We created custom graphics for the different camps they offer and provided an easy to use registration form for students to register online. We were contracted to help redesign the website of Canadian Coton De Tulear Club. Their website was developed using WordPress which allows their club executives to create and update website content as needed. This solution provides a cost-effective and efficient way for them to keep their members updated with the latest club information, newsletters, events and more! International seafood supplier Tri-Star Seafood distributes live, fresh and frozen product around the world. A multilingual website was developed to help cater to different markets in Asia and North America, all while providing one streamlined process for updating their website content in both English and Chinese. The end result is an easy to use interface which allows employees to make timely changes to their website at anytime. Based in Vancouver, Rockland (RL-TSXV) is a mineral exploration company with 3 current mining projects. Our team was brought on to help develop the website and integrate an email marketing platform to the new website. The result is a website that is clean, simple and easy to use which provides investors with the information they seek. Canadian-based mineral exploration company Oroco (TSX.V:OCO) is focused on the accelerated development of gold-bearing oxide zones in northern Sonora State, Mexico. Our team is responsible for website updates and press releases. Email newsletters are distributed when a press release is announced which proves to be a cost-effective solution to reach a growing number of subscribers and investors. Founded in 1911, Shaughnessy is a traditional private golf club located in Vancouver and was chosen for the 2011 RBC Canadian Open. Our team is responsible for the web design, development and ongoing maintenance of their website. Through a seamless integration with Jonas club management, members are now able to book tee times, view upcoming events and review statements online.